The two sides meet again after a few days’ respite, to strive to achieve an outcome this time. Firecracker time …go! First half and a patter is emerging. Every dispossession by the Wood prompting immediate vocal outcry form the visitor’s dugout. Going to be one of those matches, then. Okay. The centrefield ; Walsall Wood’s players’ role was so important in this match and swift covering moves by the Wood’s captain caused frustration and dismay throughout the match. Maturity and prowess. Delightful to spectate . End to end fire at will soccer. Here the Wood nearly score…Composure and hard work will win through eventually, but it is a nail- biting contest. The crowd are enthralled. First goal to Uttoxeter, following some magical footwork by one the Uttoxeter’s sparklers. Celebration. Well deserved, too. How will the Wood respond? the Wood begin to test the opponents’ defence. Ouch. Second goal to the Uttoxeter players. Uttoxeter’s goalkeeper in interesting unseen action. Wood corner. There were several odd moments here. Another one in the sprout bag from the Wood. Are they beginning to show their maturity and prowess now, then? Two players. Maximum concentration. Super to watch, despite some unwelcome barracking offstage. Pictures and captions Kindly supplied by the young David Evans. Yesterday evening (Tuesday 18th September 2018) Walsall Wood FC faced down weekend away rivals Uttoxeter Town who had, on the previous Saturday held Wood to a two-all draw. I’m pleased to note the the Woodmen won on home turf, in a high-scoring game that ended five to four in favour of the home side. On the floodlit magnificent green grass real lawn that is the football pitch at Oak Park, the replay of the weekend away match that ended in a two-all stalemate was set to take place. Numerous away supporters, some not seen at Uttoxeter last Saturday brought their presence and views to this stadium . We were expecting a thriller of a replay match. We were not disappointed. The visitors started the contest with swift and effective play, sometimes to great effect, and to some measure of consternation among the home side. In what was a nightmare of a first half they were three goals ahead and Walsall Wood seemed to be in shock at this moment. Uttoxeter’s passing and running was accurate and effective. The barracking given by the away bench of the referee jarred uncomfortably in my mind and detracted from the fine sport on display by both sides on the field of play. The second half saw a revitalised home team emerge after enjoying a cup of tea and cucumber sandwich with the manager. A different approach and different tactics to grind away at the questionable stamina of the opponents was employed. A pro-active scheme was rolled out. The full time score was four goals to each side, Walsall Wood playing a magnificent mature game in the second half to achieve this. Extra time was full blooded football where the maturity and skill of the seasoned home side won through. The final score was five goals to Walsall Wood, four goals to Uttoxeter Town. Uttoxeter will have learned much from their two FA Vase matches against Walsall Wood and the experience they have gained here will be remembered for a long time, I feel. Cheers to David and Russell, the faithful and of course the players. For the Good of The Wood! This entry was posted in Brownhills stuff, Environment, Events, Followups, Fun stuff to see and do, Local media, News, Reader enquiries, Shared media, Social Media, Walsall community, Walsall Wood stuff and tagged 18th September, 2018, 5-4, Events, FC, football, Footy, Good of the Wood, home, Oak Park, soccer, the wood tv, Things to do, Tuesday, Uttoxeter, Victory, Walsall Wood, Walsall WOod FC, win. Bookmark the permalink. Bob, I think we can all agree that the ref last night was shocking! Had a competent ref been officiating last night, Walsall Wood would have been reduced to 9 men! Fact. If you could see some of the damage inflicted off the ball on some of our young lads you would be horrified! 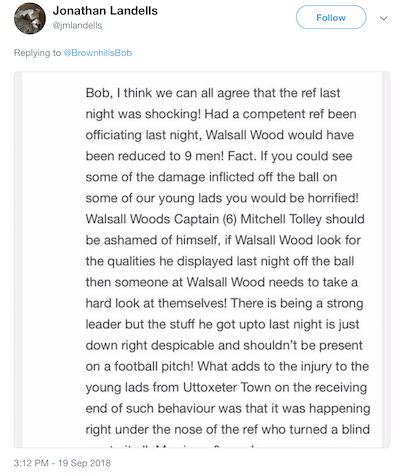 Walsall Woods Captain (6) Mitchell Tolley should be ashamed of himself, if Walsall Wood look for the qualities he displayed last night off the ball then someone at Walsall Wood needs to take a hard look at themselves! There is being a strong leader but the stuff he got upto last night is just down right despicable and shouldn’t be present on a football pitch! What adds to the injury to the young lads from Uttoxeter Town on the receiving end of such behaviour was that it was happening right under the nose of the ref who turned a blind eye to it all. My views & words are my own an welcome any constructive response to my observations. I wasn’t at the match in question, but something you’ve done here has made me question your account of matters. Note that the time, ‘…awaiting moderation’ etc. are all from your account or someone with access to it, as only a comment author gets that view. By screenshot ting this, and posting it publicly with my site name, you seem to be implying some kind of endorsement by me, of your views. Without any such endorsement being made. I find that jolly unsporting, and disingenuous.I’d expect a sporting gentleman to apologise for what can only have been a careless oversight. Now, I wasn’t overly concerned about your protracted grumble, but this lone action made me dig deeper. People present at the match last night have told a different tale: That of constant attrition of the match officials authority by one or two visiting fans, and of disrespect to other spectators. Given your interest in fair play, I hope you’ll be seeking those people out and having words. From the vast majority of accounts I’ve sought, yours and that of your pal on twitter seem at odds.